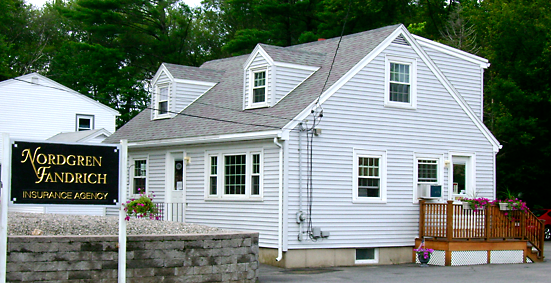 Our office started out in 1986 as Nordgren Insurance Agency when we rented 200 square feet of office space at 888 West Center Street, West Bridgewater MA. Several years later we grew to 600 square feet at the same location. By early 2007 we maxed out of space. On April 1, 2007 we changed our name to Nordgren-Fandrich Insurance Agency, Inc and we purchased our new office building at our current location and have tripled in size. We are a family owned agency. Three generations, celebrating 30+ years in business. Today the agency is run by Pat Fandrich and Kim Panos, both licensed brokers who bring over 49 years experience. We are often complimented on our outstanding commitment and knowledge of our products, personal attention and extremely friendly atmosphere we strive to give our customers. We can proudly say we still have most of our original customers!